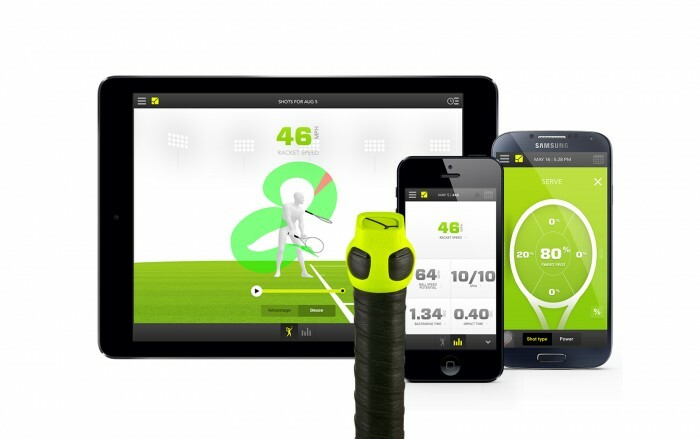 Innovative sports technology will be on display at The 2014 Tennis Show in New York City, held at the Grand Hyatt in New York City and in conjunction with the Tennis Teachers, for the benefit of the Industry. This unprecedented event plans to invigorate the end user, in this case the millions of younger and older players around the United States, and the world. According to the Physical Activity Council (PAC) 2014 Participation Report, there are 17.68 million tennis players in the U.S. which is a 4 percent or a 658,000 increase from the year before so the sport is on the rise. The fact that the 2014 US Open begins the day after the event opens this Sunday for the business of tennis people and companies to attend, will undoubtedly increase awareness about the sport, and tennis sports tech products and services, for youth to adults, as well as amateurs, professionals and the fast-increasing elderly participants. A vast array of racquets, solutions and easy-to-use devices will be on show, all designed to improve a player’s game, offer the mobile ability to track tennis strokes, with intuitive match and player analysis system, such as created by Zepp Labs. The Tennis Show 2014 was founded for the tennis industry teaching professionals and coaches, retailers, facility owners/managers, manufacturers and players as a way celebrate the historical game and interact together about the business of tennis. The afternoon festivities start with an informative media briefing at 4:30 p.m. that features the Tennis Industry Association (TIA) Tennis Forum and the Tennis Industry Hall of Fame induction. An innovative call-to-action for event attendees is a custom link to their own Tennis Show “Virtual Bag,” viewable on all digital devices such as smartphones and tablets. The TIA and VirtualEventBags.com partnered to present show attendees with the option to view, save and redeem offers from exhibitors in addition to proactive corporations and establishments that could not exhibit at the sold-out event. If you go, it is suggested you download The Tennis Show app to your smartphone. The mobile application is full of exhibitor information, the map of the show floor, event times, and the option to make a “to do” list, allowing you to see fellow show attendees. The social media functionality allows users to post photos and content to Facebook and Twitter. In order to download the app, start with loading the “Guidebook App” onto your mobile device, and clicking “Download Guides” at the bottom of the screen then search for “The Tennis Show 2014” Guide. The 7th Annual TIA Tennis Forum gets rolling at 5:15 p.m. in Salon V of the Grand Hyatt New York. The discussion focuses on the tennis industry trends and topics including participation metrics, data about equipment sales, important grassroots initiatives, Youth and Junior Tennis programs, plus much more. The exciting Tennis Industry Hall of Fame induction is the last forum component led by pioneer and former TIA President Jim Baugh. Tennis Industry Hall of Fame inductees, including Billie Jean King, Nick Bollettieri and Dennis Van der Meer, have plaques on permanent display at the International Tennis Hall of Fame in Newport, R.I.
Perhaps the highlight of the day will be at 6 p.m. when The Tennis Show, managed by the TIA, migrates to the Manhattan Ballroom and Lobby Level Reception, highlighted by the newest gear, products, technology and services from over 50 companies and organizations. Finally, participating businesses are conducting prize drawings for merchandise and services with an estimated value of more than $20,000. The sports tech at this game-changing event is aimed to immediately grow the sport. A vast array of racquets, solutions and easy-to-use devices will be on show, all designed to improve a player’s game, offer the mobile ability to track tennis strokes, with intuitive match and player analysis systems. There will be proven software solutions invented to match up like-minded players, discovery the right coach, and help entrepreneurial tennis-centric companies run their operations with more digital and cloud capabilities. The Sports Techie tennis industry leaders, executives and professionals who gather on Aug. 24 in New York City will honor the past, present and future of the game so be there or follow online via their web site. Earn your rating and play with compatible players. Sports federations, associations and leagues worldwide are turning to technology to be the champion of their sport into the future. PAC survey data indicated the only traditional sport to be ranked in the Top 10 in terms of participation growth, out of nearly 120 sports and activities, was tennis. Greg Mason, president of the TIA, said, “It’s interesting to note that tennis is the only ‘traditional’ sport on the PAC Top 10 list.” The top nine PAC report sports were, walking for fitness, swimming for fitness, running/jogging, bicycling on a non-paved surface, aerobics (high-impact), backpacking overnight, bicycling on a paved surface, yoga, and trail running, followed by tennis. DARTFISH Express app for iOS Universal works together with the new My Dartfish Free and Premium. I spoke to Tennis Analytics Founder, USOC Consultant, and Dartfish (my former employer) Director, Warren Pretorius, about their well-established video analysis solution and cloud sharing Dartfish TV platform, the launch of their My Dartfish Free and Premium (expanded storage space) business model, and how the technology can be used to improve coaching and as a learning tool. The Dartfish Express iOS video app has a nominal cost of $5. It is easy to administer and can be logged on with a web enabled device online where the coach uploads to the platform. It operates inside a controlled environment offering telestration, key positioning and audio, and side-by-side and technical analysis. Pretorius was excited about the software’s ability to download annotated clips, and also use reference clips from another channel, then use the clips in the app as a teaching reference clip with students. Reference clips can also be downloaded on YouTube or Vimeo and then locally built. 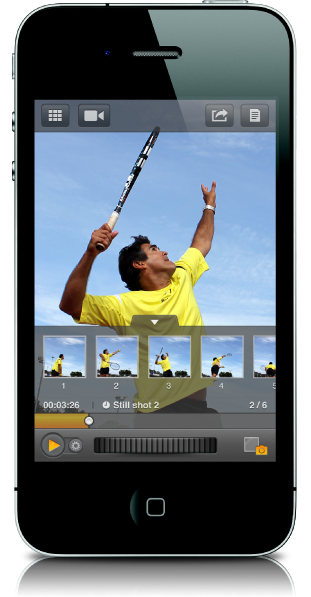 Typical workflow for a teacher would be to download a reference clip of a pro, then film your player at a practice session or during match play. Next, use the tool and follow that by playing the clip back to show visual comparisons to a pro. Have him or her, practice again and do the same routine. After a few weeks’ time have past, perform another lesson with additional side-by-side analysis which can be downloaded to a kids app each time, where they can easily review the lesson on their own. There is no need to store footage on app devices, push it to cloud collection on Dartfish TV. Dartfish Notes is used for charting, indexing, and tagging, detailed analysis and the delivery of shared content on Dartfish TV using their tiered approach. Simulcam and Stromotion clips cannot be added by smartphones yet, they are not good enough but you can use a computer in the office and then download it to a phone as part of a lesson plan. The entry level cost is $250 for 5 gigs of storage space. The system uses the DropBox model, so if an instructor exceeds sharing the free data amount limits, the 5 gigs are available as an upgrade purchase. Warren said, “Since compressed clips are recorded, often 2 seconds in length, it should be enough memory for most all users.” This is a clean environment meaning there are no ads. By subscribing to the Premium channel, users can decide if they want to share clips because child protection laws for kids 14 years and under in all states makes it illegal for coaches to share video and images on social media platforms. The “best practice” for social media is to upload to your Dartfish TV channel, then share via email or as a text message, on Twitter or Facebook, via the embed player. By sharing rendered clips with a link only, the onus goes to the players whether they wish to share the actual videos on social media putting another protective digital layer between youth and coaches. This is the same internationally in most countries, including his home nation of South Africa. Dartfish is heavily involved with USTA and USPTA, who are hosting a joined show, their first combined show, at the US Open, with manufacturing and education together for the first time. They are also working with the ITF. Their Tennis Show goal is to educate the Industry, expand recognition, show how Dartfish is not expensive software any longer and is an affordable teaching tool with a cost of less than $25 a month. The Android version is a few months away. Tennis Analytics is a client partner with Dartfish, They use ten computers and six guys who often work on two computers at a time, chopping and changing between each PC, while charting and tagging approximately 200-300 hours per week, with an additional outsourced team in India creating an extremely scalable business model. 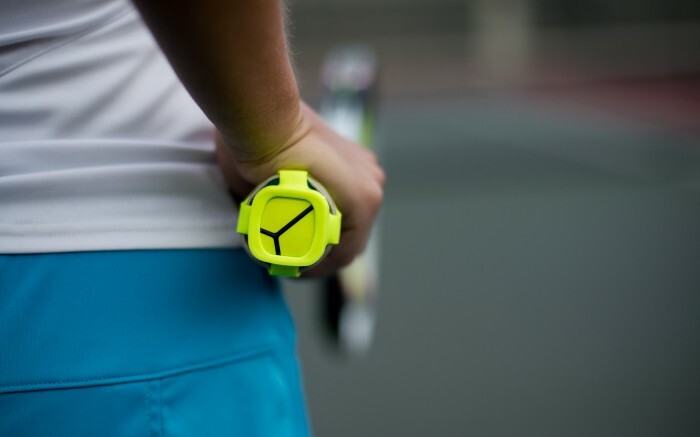 Some of the other sure to be hit products are the Babolat Play Sensors that track a player’s strokes via the Babolat Play racquet, as well as wireless devices created by Zepp Labs. 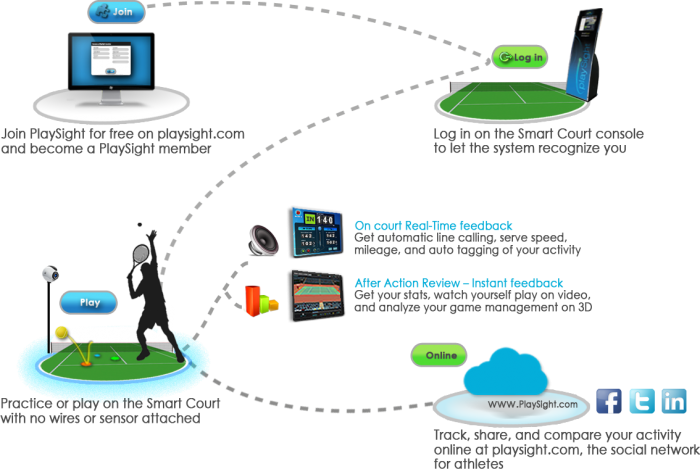 PlaySight offers free real-time and post-match stats, tennis analytics and line-calling. A host of sports tech providers such as Club Automation, MyTennisLessons.com, PlayYourCourt.com, TennisSource.net and USPTA Player will be on hand showcasing management solutions for tennis clubs, instructors and facilities to help drive revenue and increase participation in the game via new, established and returning players. I have decades of experience in the “software as a service” (SaaS) Industry while in Seattle, California and here in Atlanta, especially with CRM, and believe the TIA is on the right track by creating new opportunities for technology development companies by assisting tennis providers with core business functionality such as managing, marketing and lead generation, as well as customer retention and the all-important, new business development opportunities. “TIA SaaS Business Partners” or those who are part of the community of TIA Recommended Software and Business Solutions, include show exhibitors Club Automation, MyTennisLessons.com, PlayYourCourt.com and TennisSource.net. Additional TIA SaaS Sportsbiz Partners are the Active Network, TCPS (TennisConnect Professional Services), Tencap Sports, Tennis Biz and ZOGOtennis. “Our SaaS partners provide software applications remotely as a web-based service,” says de Boer, “which bring costs down dramatically for tennis facilities and other providers, while ensuring the technology is the most current available anywhere.” She emphasized how the cutting edge TIA has been monitoring Big Data surrounding the growth of technology over the past several years resulting in more than 80 companies being identified with this type of cloud based service. For more about The Tennis Show, and to learn additional info about all 50+ companies exhibiting on Sunday, visit TennisShow.com. Anyone affiliated with the tennis industry please register to attend The Tennis Show on their website. The current attendee list is below and at TennisShow.com. Book a tennis lesson near you! About the TIA The Tennis Industry Association, the not-for-profit trade association for tennis, is THE unifying force in the tennis industry whose mission is to promote the growth and economic vitality of tennis by working closely with the U.S. Tennis Association and industry partners to develop and implement initiatives to increase tennis participation and improve the health of industry businesses. Core TIA activities include producing more than 70 research reports annually on participation and consumer/trade research, in addition to Grow the Game Initiatives such as PlayTennis.com, 10 and Under Tennis, the GrowingTennis System™, Tennis Welcome Centers, Cardio Tennis, Careers in Tennis and Tennis Tune-Up Campaign. Visit TennisIndustry.org or call 866-686-3036. How does PlaySight work? It is a SmartCourt for free. Sports Techie, Is The Tennis Show a grand slam or what. New York is going to be popping with US Open buzz augmented by this events agenda to grow the game using sports tech products, systems and companies. Wearable tech is another niche that will have a presence at the event. If you are in the Industry, I advise you to lock into the Tennis Show whether virtually or at the live event. Because you will walk a lot, here is a review of walking shoes by Asics. If you attend, please add a blog comment or via any of our any of our #SportsTechie social media network links below about what you liked, trends and business opportunities, so others can learn about it and help grow the game and fan experience too. See y’all later here in Atlanta. Old article but it’s still interesting and informative, thanks for this such a wonderful informative article about tennis show.